To declare that natural pools are all those which don't contain chlorine wouldn't be good enough. There is so much more to be said about them. 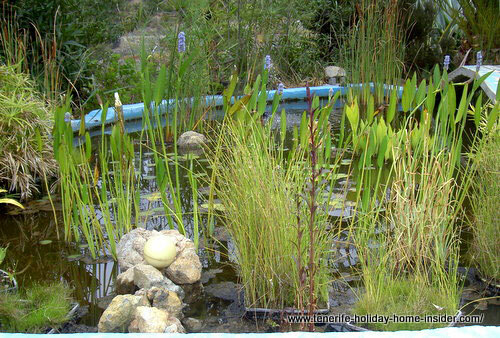 Depicted above is a natural pond of a private farm. Water that originates from the trade winds feeds it. Pipes from a nearby slope in Icod de los Vinos transport it. It's a very pretty, natural set-up but I wouldn't return to it. Mind a cheaper tariff for the agricultural use of water can be obtained in this case. Let me come to the point. Then, you may read on and may add others to them. All of them have been improved by volcanic landscaping. A highly sophisticated system maintains their saltwater content spotless. Only natural ocean rock pools may compete with that standard. This natural jewel of a remarkable hotel lake where a bridge separates its two parts is a different story. Not just by size... Why? It's brimming with Koi carps. 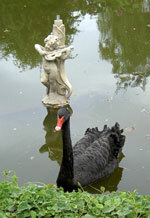 Often, there are black swans with their off-springs and tortoises bath on stones by the water's edge. Butterflies visit captivating flowers by its shore and birds sing in the surrounding trees and palms. 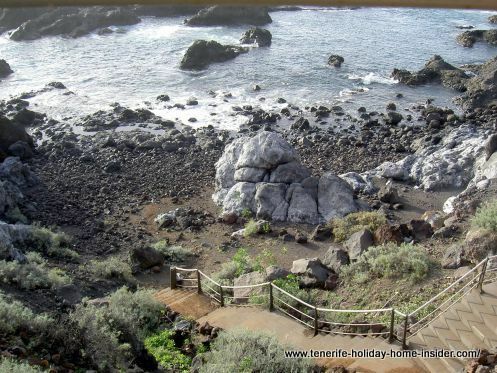 The natural pools of El Caleton of Garachico are the result of a grave volcanic eruption. Rocks almost enclose the swimming basins totally. Underneath is said to be a wonderful sea world. 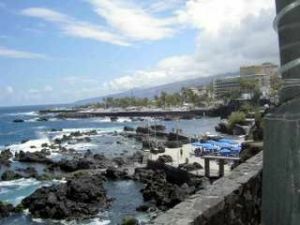 Important to know is that this San Telmo area which is also known as Playa San Telmo is quite safe for swimming and snorkeling during low tide. Why? Its geological Lava outcrops are often protective barriers for the so called Charcos whom we know as tidal pools. They make up a fairly large area of semi open, rocky, volcanic enclosures. Actually, there are two sets of dog friendly, natural pools by this shore of the giant cliffs both of which are near each other. Discover why the Siam Surf pool feels so natural when you read up on the topic water sports of Tenerife. There even is a surf video. Then, there is the Loro park fun. Enormous water basins provide natural conditions to let dolphins, sea lions and Orcas entertain you with their stunts. That's the former natural water reservoir of San Cristobal de la Laguna. Unfortunately, this enormous inland lagoon that was the reason for the initial Tenerife capital in this spot dried out over the centuries. Are there natural swimming pools at el Guindaste? That's what locals say who also swim at el Guindaste. They know when the ocean is safe. However, this insider beach is much exposed and often dangerous. Why are natural rock pools fairly safe? Man made walls together with rocks are meant to protect the swimmer by such pools at a seashore. The conditions of swimming options in the wild by Los Gigantes shores, San Telmo and Garachico are similar. Not to forget the Charco de la Laja by San Juan de la Rambla which is known for its prominent horse shoe shape at its best times of the day. Of course, there are many more, most of which are smaller or less breath taking. Charco de Don Gabino a real nature swimming pool of Los Silos by its "Sweet water beach" is a typical smaller version. I've been there on April, 02, 2011 and there was no sign to confirm its name but there was the museum plaque of the stunning fossilized whale next to it. The Charco de la Araña is a picturesque "Atlantic tarn" by Caleta de Interian. The gigantic public swimming pool basin of the Puerto Cruz swimming club by Playa Jardin isn't filled with ocean saltwater any more. It needed repairs but no funds have been available until now in 2018. So I am told. The photo beside depicts the good old days with a water ball match of 2010. 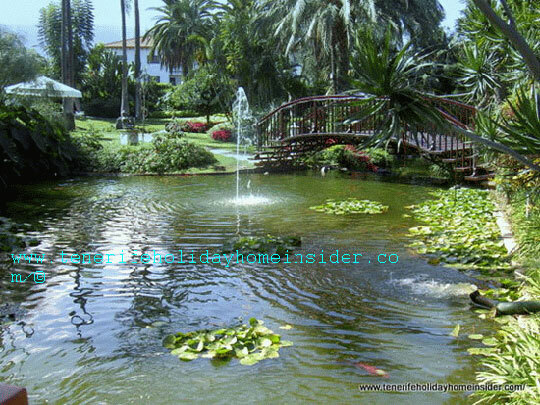 The Puerto de la Cruz Risco Bello Park ponds may have been filled by a mountain fountain once. Today, these murky pools are called ugly by some. You cannot sea fish in them. Nevertheless, they look wild with their sea roses, papyrus and reeds. Indeed, the mirror image of the Risco Bello still water with red beaked black swan beside is enough proof for acceptable natural conditions. 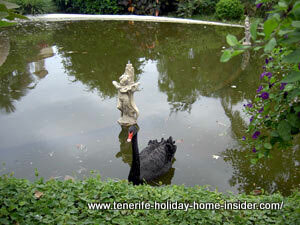 A Guanche pool with splendid gardens around it was mentioned by the historian Boccaccio. It was owned by the higher class of the former Tenerife natives the Guanches. Depicted is a natural pool scene by a colorful mural in Taoro Park. None of them exist in Tenerife although there is snow by Mount Teide in winter. 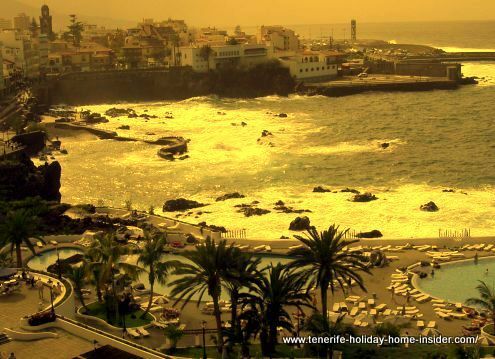 However in winter, the capital Santa Cruz de Tenerife is said to have an ice skating pool by Plaza de España. Around Christmas, this wide basin is covered with artificial plastic which simulates ice and makes it possible to skate on it. Lido Los Gigantes nature pool. 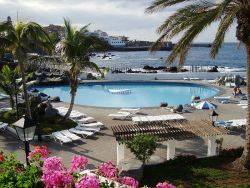 Coming to think of it only its closeness to the ocean gives the pools of the Lido of Los Gigantes a natural feel. It's not the landscaping around it. 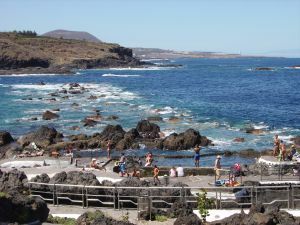 The same applies to an extent to Parque Maritimo César Manrique and the swim basins at Baja Mar. However, all contain saltwater from the Atlantic. Note that there are still underground pools below ground in the Puerto Cruz district of Plaza del Charco, by el Muelle and part of Calle Lomo as well as by church San Francisco with its naturally fed pond. Once, the area had many shallow ocean pools above ground. Some buildings of this area installed pumps to keep building basements and foundations protected against mould, mildew and rotting walls. 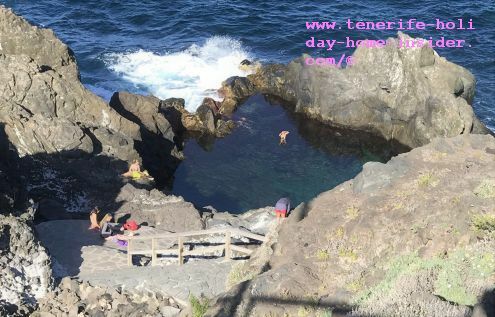 From natural pools back to Tenerife beaches.